Developed for use with the student book based on the Uniform Series, this leader resource provides a wealth of information, planning ideas, and lesson guides for each of the 13 lessons in the quarter. This resource includes detailed study of the biblical text, suggestions for developing lessons, teaching options, maps, and charts. It features articles that explore biblical themes related to the passages studied in the lessons. Dont forget to order your student books, which are found in the Related Products Section below. Stan Purdum was a parish minister in Ohio for several years. He currently works as a freelance writer and editor. He writes curriculum for Cokesbury and edits Emphasis and Proclaim, both nationally circulated preaching journals. He formerly was executive editor of Homiletics, the most widely used preaching resource in America. He has a Doctor of Ministry degree from Drew University Theological School. Stan's other books include Roll Around Heaven All Day and Playing in Traffic, both accounts of his long distance bicycle journeys, as well as New Mercies I See, a collection of parish stories of God's grace. Stan and his wife, Jeanine, live in North Canton, Ohio. They have three grown children. 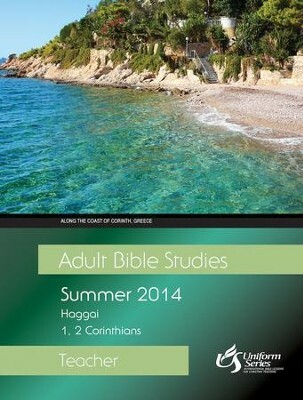 I'm the author/artist and I want to review Adult Bible Studies Summer 2014 Teacher - eBook.